This is beautiful <3 and super cute! Omg this is the best piece of fanart for any anime or anything... EVER. It's heartwarming...and... I don't know, I'm speechless. It's just BEAUTIFUL. This is such a heartwarming painting you made. Everytime I see it, my heart just melts away.. very inspiring also. I really love the colours and the way you painted them, especially their peaceful expressions.. I hope to see more of your anime art in the future! thank you alot for your words! OH DEAR GOD THIS IS THE MOST GORGEOUS AND PERFECT AND JUST SPOT ON FANART OF THESE TWO. JUST. WOW. BEST FANART I'VE SEEN. EVER. You've completely captured their love and friendship with such warm and appealing colors that fit both of them and in such anatomy and drawing technique I can't help but ask why does this not have a DD yet? JUST. PERFECT. SERIOUSLY. Amazing. Oh my! Thank you very much for such a kind words! Don't mention it! You really deserve all of those and more for that wonderful piece of awesomeness. I love that anime and you captured them perfectly! 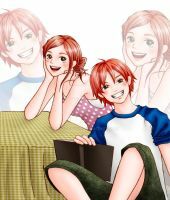 That is my FAVOURITE RisaXOtani picture in Deviantart!!! So cuuuuuuuuuuuuuuuuute x3 I love the way you colored it too! too awesome!! I so want to read the manga all over again now!! Great job! !